These fingernail divots won't impair playability; they don't actually need to be repaired. But, they are unsightly, so let's see what can be done to improve the look. The holes could be filled with a synthetic compound, a mixture of glue and sawdust, or they could be inlaid with new wood. 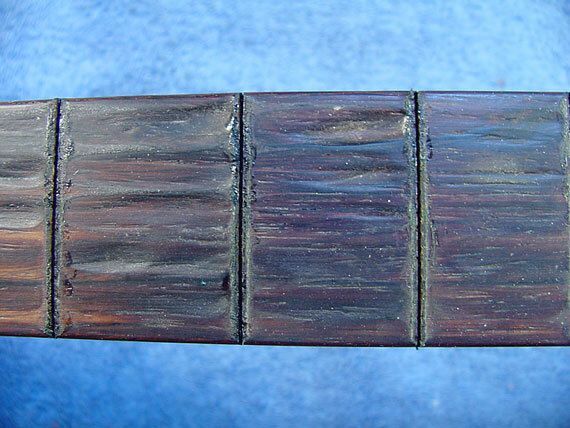 In general, filling the dents with an different material tends to produce an uneven wear in the future, and the filled areas stand out clearly. 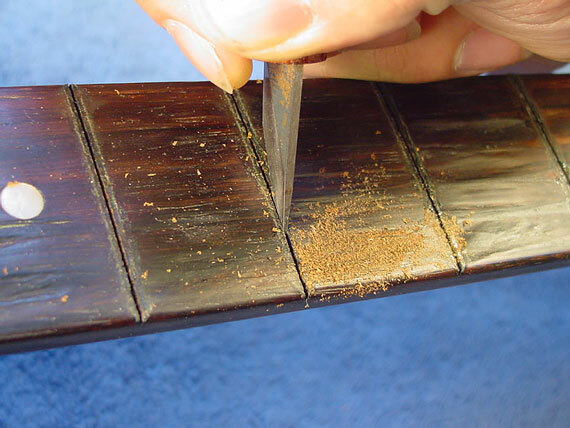 Removing sections of the fingerboard and inlaying new wood is not only intrusive but it's also very time consuming. Here's a newer technique that works amazingly well to fill and disguise the worn holes. First, I'll take a single edge razor blade and make some deep cuts through the bottom of the divot. 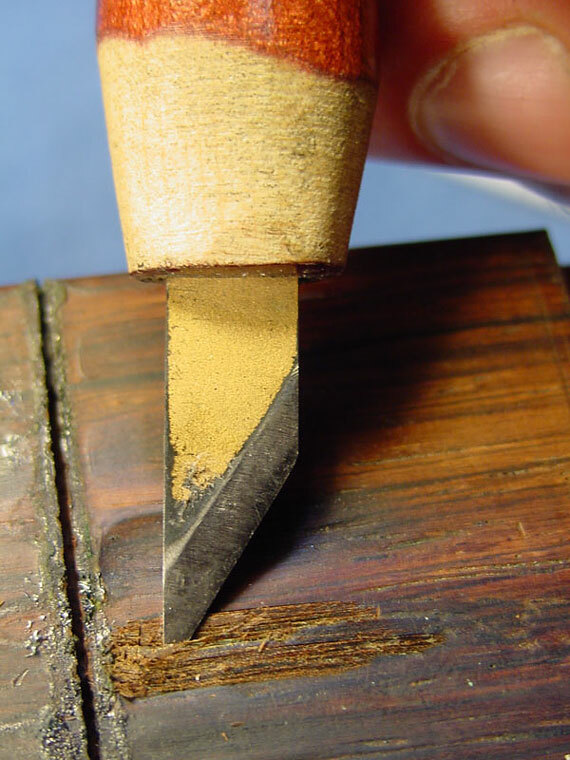 Now, with my violin knife, I can lift and separate the cut fibers, raising the edges of some of them to about the level of the surrounding board. 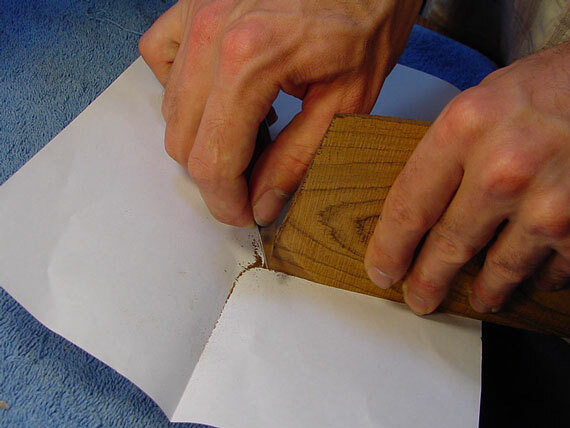 The idea is to create a kind of "web" of wood fibers without breaking them completely loose at the ends. 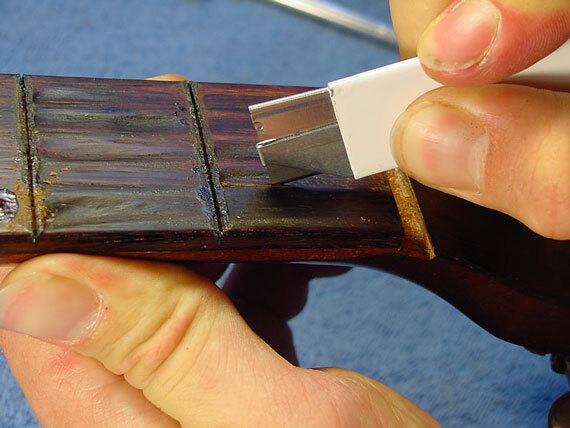 To fill the voids, I want some fine sawdust that's compatible in color, so I scrape the end grain of a piece of rosewood that's considerably lighter than the fingerboard. Previously, I tested samples of various colors, wetting them with a bit of thin cyanoacrylate to see what color would develop. 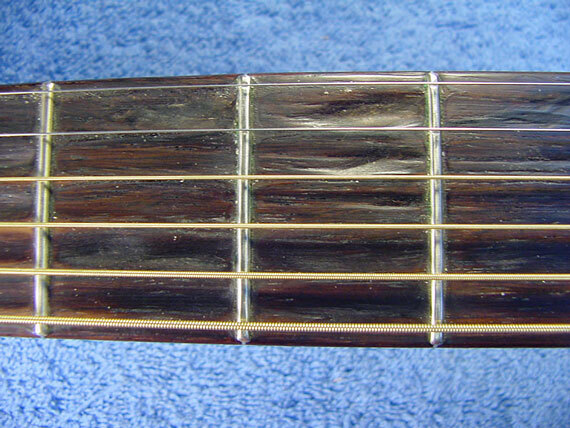 I found this particular piece of very light rosewood was just about perfect for the job at hand. 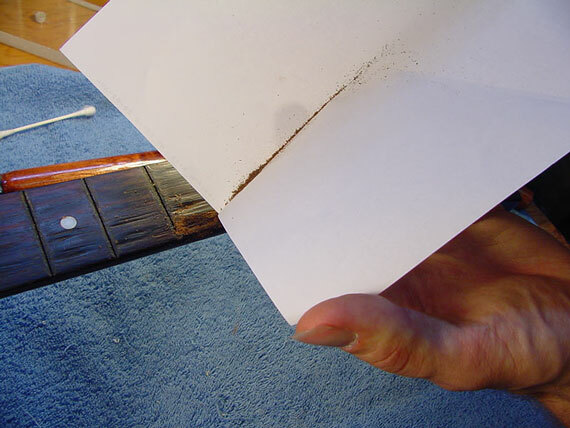 If the fingerboard had been ebony, I would probably have used a bit of ebony dust and/or a little lampblack pigment as filler material. From the paper to the board. And, I'll pack the dust into the cuts I made in the divot area. 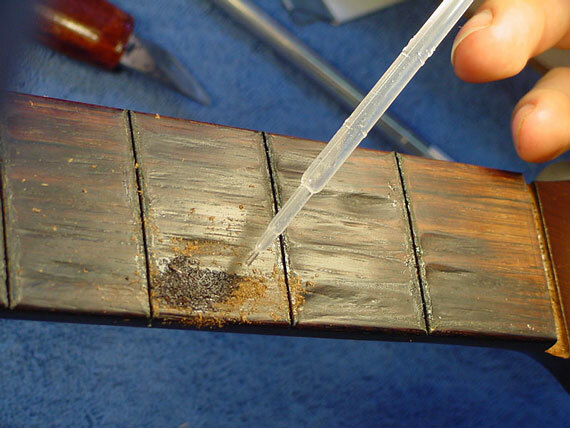 To avoid making a mess of the fret slot, I just clean it out before applying the adhesive. Here's another reason they call it "super" glue. 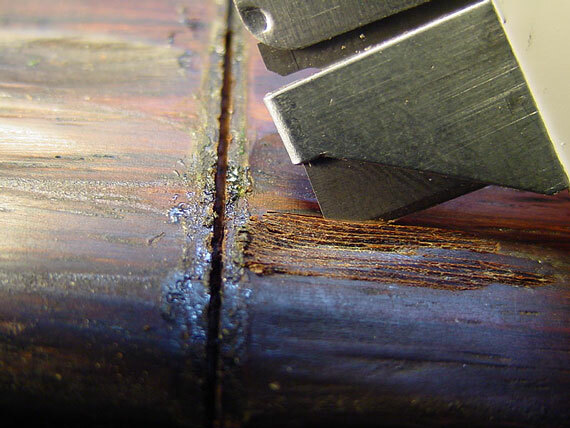 The thin cyanoacrylate runs fully into the area, wicking down to the bottom of my cuts, and forming a solid matrix of the sliced original wood and new sawdust. 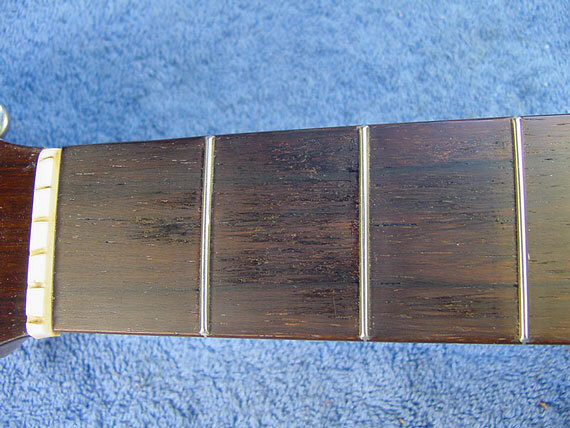 After the fingerboard is sanded and the fret job completed, you'd be hard pressed to identify the divot areas. 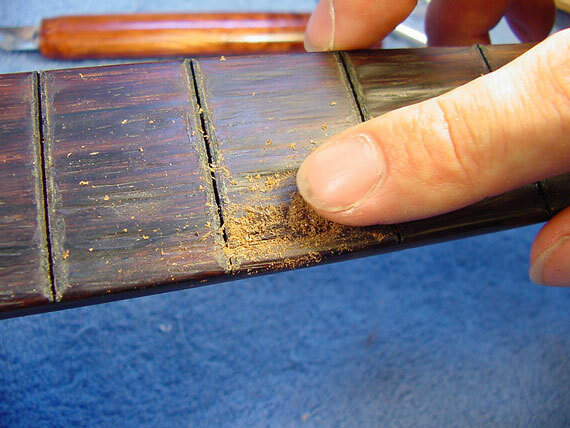 And, as the fingerboard begins to wear under the player's hands, the matrix of original wood fibers will help keep up the illusion of original solidity.